An ecologically comprehensive, resilient and representative network of marine protected areas that protects the biological diversity and health of the marine environment for present and future generations. Network planning in the Northern Shelf Bioregion is guided by the six goals for a coast-wide network of marine protected areas that are identified in the Canada-British Columbia Marine Protected Area Network Strategy (the Strategy). The governing partners in this initiative – Canada, B.C., and 17 First Nations will use these goals for the NSB MPA Network planning process. The goals are the primary means of achieving the vision for the network, and they provide the umbrella for the development of more specific network objectives. Of the six goals listed below, Goal 1 takes priority. To protect and maintain marine biodiversity, ecological representation and special natural features. To contribute to the conservation and protection of fishery resources and their habitats. To maintain and facilitate opportunities for tourism and recreation. To contribute to social, community and economic certainty and stability. To conserve and protect traditional use, cultural heritage and archaeological resources. Together with the goals and objectives the suite of 16 guiding principles, identified in the Canada-B.C. MPA Network Strategy, will help to guide site selection and shape the network planning process. Network principles, listed below, are separated into three categories: ecological design principles, socio-economic and cultural design principles, and general operating principles. Together with the goals and objectives, the principles will help guide site selection, and shape the network planning process. These principles draw on international best practices and support a balanced approach to the protection of ecological, socio-economic, cultural and spiritual values in the MPA network. Include the full range of biodiversity present in Pacific Canada. Ensure ecologically or biologically significant areas are incorporated. Ensure maximum contribution of individual MPAs. Recognize and consider the full range of uses, activities and values supported by marine environments. Enhance management effectiveness and compliance to maximize benefits and minimize costs. Respect First Nations’ treaties, title, rights, aspirations and world-view. Build on existing MPAs, other management tools and marine planning initiatives. Include a full range of protection levels. Well-developed bioregional objectives will play an important role in achieving the vision for a network of marine protected areas in the Northern Shelf Bioregion. Nesting under each of the six network goals, the network objectives identify and focus management priorities, provide a context for resolving issues, a rationale for decisions, and a means for assessing network effectiveness. Like goals, objectives describe a desired future state for a particular value. They are, however, more specific and concrete than goals. The objectives, along with the vision and goals, lay the foundation for network planning, and were developed with the scale of the network in mind. The objectives for the network will not apply to individual marine protected areas which will have their own set of objectives written into a management plan. 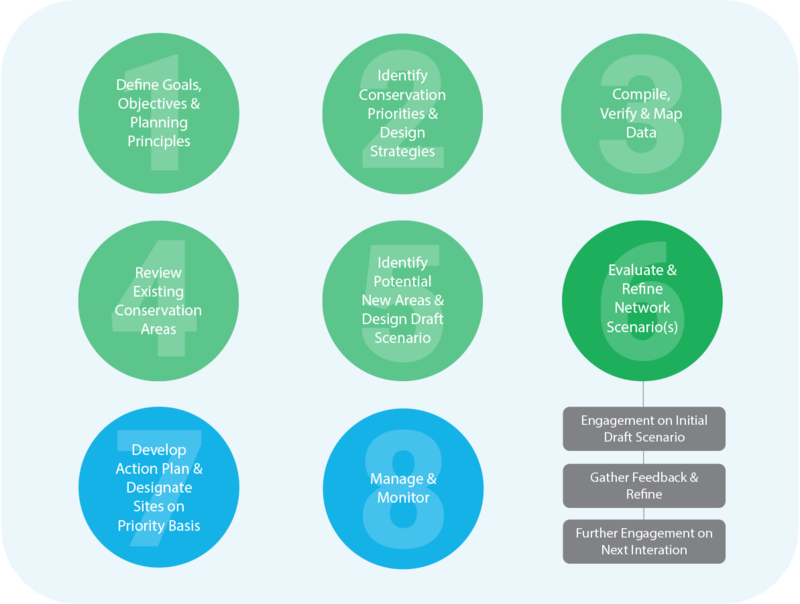 Consistent with the Strategy, objectives that nest under Goal 1 are of primary importance in network design. Network objectives were developed by the Marine Protected Area Technical Team (MPATT) with input from other governments, stakeholders, academics, and practitioners. GOAL 1: TO PROTECT AND MAINTAIN MARINE BIODIVERSITY, ECOLOGICAL REPRESENTATION AND SPECIAL NATURAL FEATURES. 1.1 Contribute to the conservation of the diversity of species, populations, and ecological communities, and their viability in changing environments. 1.2 Protect natural trophic structures and food webs, including populations of upper-level predators, key forage species, nutrient importing and exporting species, and structure-providing species. 1.3 Conserve areas of high biological diversity (species, habitat and genetic diversity). 1.4 Protect representative areas of every marine habitat in the bioregion. 1.5 Contribute to protection of rare, unique, threatened, and/or endangered species and their habitats. 1.6 Conserve ecologically significant areas associated with geological features and enduring/recurring oceanographic features. 1.7 Contribute to conservation of areas important for the life history of resident and migratory species. GOAL 2: TO CONTRIBUTE TO THE CONSERVATION AND PROTECTION OF FISHERY RESOURCES AND THEIR HABITATS. 2.1 Maintain or improve stock stability and productivity of species important for commercial, recreational, and Aboriginal fisheries. 2.2 Maintain within protected areas the natural size and age structure of fished populations. 2.3 Conserve habitat important to ensuring that the productive capacity and harvestable biomass of commercial, recreational, and Aboriginal fisheries species are maintained within healthy and resilient ecological limits. GOAL 3: TO MAINTAIN AND FACILITATE OPPORTUNITIES FOR TOURISM AND RECREATION. 3.1 Conserve sites compatible with, and of high value for sustainable tourism and recreation. GOAL 4: TO CONTRIBUTE TO SOCIAL, COMMUNITY AND ECONOMIC CERTAINTY AND STABILITY. 4.1 Enable economic development opportunities that are compatible with achievement of conservation objectives contained with Goal 1. 4.2 Maintain or enhance the long-term productivity, resilience and reliability of marine ecosystem goods and services. 4.3 Support opportunities for local communities to benefit socially, culturally and economically from marine protected areas. 4.4 Strengthen participation and representation of communities and stakeholders in design, establishment and monitoring of the network. 4.5 Ensure that all marine protected areas have clearly defined objectives and effective and adaptive management including monitoring, evaluation and reporting. 4.6 Support effective MPA network governance that includes monitoring, evaluation and reporting. 4.7 Establish collaborative approaches to surveillance and compliance monitoring. GOAL 5: TO CONSERVE AND PROTECT TRADITIONAL USE, CULTURAL HERITAGE AND ARCHAEOLOGICAL RESOURCES. 5.1 Increase awareness and understanding of First Nations use and stewardship of resources and territories. 5.2 Represent marine areas of high cultural or historical value. 5.3 Contribute to conservation of species significant to First Nations and coastal communities including those important for cultural use and food security. GOAL 6: TO PROVIDE OPPORTUNITIES FOR SCIENTIFIC RESEARCH, EDUCATION AND AWARENESS. 6.1 Increase awareness, understanding and stewardship of the marine environment. 6.2 Protect reference sites to support research and management. 6.3 Monitor and report on effectiveness of management actions across the network. Specific representation targets, design strategies, and scales will be further defined, taking into consideration national and international best practices and commitments (e.g., Aichi Target 11). Design guidelines provide guidance on the application and implementation of the principles outlined in the Strategy. The design guidelines complement the network objectives. While the network objectives focus on the desired future state of a value, the design guidelines address the process of creating the network itself. Design guidelines consider ecological, socio-economic and cultural factors in the overall design of the network to influence where MPAs are located, and how they are selected, refined, and zoned to achieve the principles. Expert advice informed the development of design guidelines this advice will be used to develop a refined suite of guidelines to support network planning in the NSB. Conservation priorities are the features to be protected in an MPA network, and can be ecological (e.g., ecologically significant species, habitats or areas) or cultural (e.g., species or sites of cultural significance). Conservation priorities can also include features important for sustainable tourism and recreation (e.g., kayak routes or campsites). Conservation priorities are developed from and contribute to network objectives. For example, conservation priorities may be identified for each network objective, as appropriate, and may support more than one objective under multiple goals. Conservation priorities focus planning and management measures by identifying and spatially delineating the specific features that need to be conserved in order to meet the network’s goals and objectives. By focusing spatial planning towards areas of high conservation value (e.g., areas where multiple conservation priorities overlap), the benefits of the MPA network can be maximized. Design strategies describe how the conservation priorities will be spatially incorporated into the network, and include area-based targets for conservation priorities. Targets are quantitative estimates of how much of each feature (e.g., habitat types or species) should be included in the NSB MPA Network as well as key variables such as size, spacing, and replication. Examples of design strategies could be to protect a certain percentage of the area covered by a habitat type (e.g., mudflats); to include a certain number of replicates of a specific habitat in the network; or to protect a proportion of a conservation priority’s distribution (e.g., X % of distribution of species A). Informed by all previous stages of the NSB MPA Network planning process, network design scenarios identify priority areas for conservation and options for possible configurations of marine protected areas in the Northern Shelf Bioregion. An analysis of existing conservation measures (e.g., ecological reserves, parks, conservancies, fisheries closures) will be conducted to identify which design strategies may already be adequately addressed. The boundaries of these existing conservation measures may be refined and protection levels modified to meet the network objectives, conservation priorities and design strategies, while new MPAs with recommended protection levels may be suggested to meet the same. Spatial planning tools will be used to identify areas of high conservation value (i.e., areas where multiple conservation priorities overlap). At the same time, human uses in the NSB will be mapped to identify compatibilities between uses and ecological conservation priorities and to understand the potential socio-economic impacts of network scenarios. The social, economic and cultural impacts of the various scenarios will be assessed and will result in the modification of the network sites and associated boundaries to minimize costs as much as possible. This stage in the process will be iterative and informed by engagement, resulting in modification of network sites, associated boundaries, and protection levels. 3) Non-partner First Nations, other governments’ and stakeholder interests. A final NSB MPA Network plan is expected to be completed by March 2019, and the MPAs that make up the network will be established thereafter. An implemented NSB MPA Network should be evaluated regularly to assess effectiveness. Various elements, such as conservation priorities and design strategies, may change over time, and can be adjusted through adaptive management.